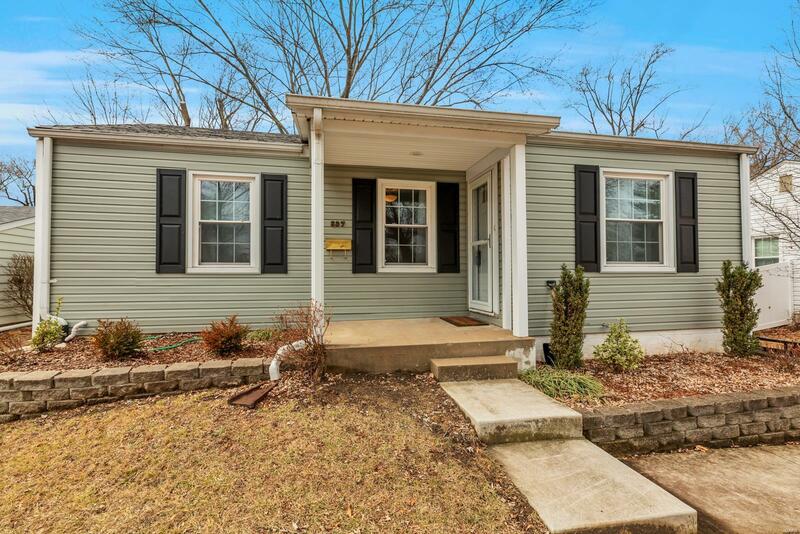 THIS IS THE COMPLETE PACKAGE: A CHARMING 3 BEDROOM RANCH WITH ATTACHED 1 CAR GARAGE, NICE DECK AND FENCED IN YARD - ideally located in Webster Groves. Renovated in 2015 - this one is move-in ready. You will appreciate the low maintenance exterior with its vinyl siding, enclosed soffits and architectural roof. The level backyard is completely fenced with some newer fencing. The kitchen opens to a spacious deck great for summer BBQs & entertaining. ADDED BONUS: you can watch the 4th of July fireworks from this deck! PLUS THE INTERIOR IS REALLY SHARP: Newer kitchen and bath, lovely hardwood floors, ceiling fans, & a youthful color palette complete the decor. IT'S ALL HERE....and all within walking distance to Webster Schools, the Webster Groves Rec Complex pool & ice rink, and nearby Blackburn Park. The safe in basement stays with house. Don't miss this one! Showings begin Saturday, February 9th. AND there is an OPEN HOUSE on Sunday, February 10th from 1-3 PM.